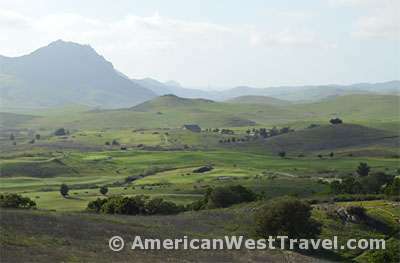 We’ve been exploring the California Central Coast (primarily San Luis Obispo County, about midway between Los Angeles and San Francisco) for many years. Except for a brief mid-winter pass-through years ago; our travels have always taken place in summer. After focusing this past summer on the wonders of Southwest Colorado and the San Juan Skyway, we couldn’t pass up a late October trip out to the coast. It turns out to have been a great choice. Autumn offers the best weather on the coast with beautiful, warm weather and virtually no fog which generally persists through the summer especially in the mornings. The other benefit is highly reduced tourist crowds. The world has discovered San Luis Obispo County, and summers have become increasingly busy; no more hidden secret. After a long, hot summer focused well away from the ocean, we decided to make this trip “maritime focused”. Except for the first night we would be camping exclusively, again in the pickup truck with the shell and carpet kit. Ove the past year this has become a very comfortable and economical way of touring. Of course, it works only if the weather is good. October 25: The first day of any trip to the Central Coast from Arizona is always the most difficult. We have a motel reservation in Ventura, California (camping is difficult in this area) which is 450 miles from Scottsdale. This drive crosses the Los Angeles Basin from end to end, offering hours of scary, stressful driving and excellent chances of one or more traffic disasters along the way. And in fact, we got two of them this trip, one causing an hour’s delay; the other, a long detour. Google Maps said it was a 6 hour 37 minute trip; we were well over 8 hours. Whenever we stay in Ventura, we like to purchase dinner at the Peking Palace which offers authentic-style Szechuan dishes (no veggies in the Kung Pao Chicken) that I love but cannot find at home. 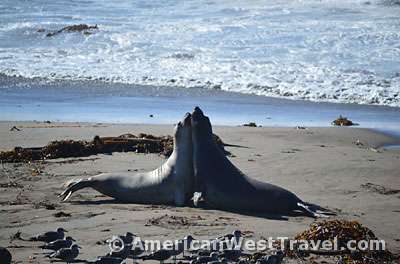 October 26: It is another 140 miles to San Luis Obispo with plenty of ocean views along the way. Unlike in summer, traffic thins out dramatically west of Ventura. This is now fine road trip driving, and we reach out destination without any difficulty. After getting set up at the campground and eating lunch, we head to the village of Baywood Park for its Monday afternoon farmers market. The village sits on the innermost section of Morro Bay (the actual bay, not the town of the same name). The market is across the street, and it is an extremely pleasant combination. Plus, we have access to wonderful fresh (organic) produce definitely not obtainable in the desert. While the weekly downtown San Luis Obispo Farmers Market is huge and famous, the local markets are more fun. They consist of mostly small family farmers and vendors who often have unusual wares, plus rapport with their customers. A few vendors recognize me (and I recognize them) though I come no more than once a year. From there we stop for a hike at the nearby Elfin Forest Preserve featuring boardwalk trails through a forest of dwarf oaks, trees that are hundreds of years old and only a few feet tall. The preserve abuts the Morro Bay tidal estuary with beauty views with beautiful backdrops. The estuary consists of mud flats and channels which fill at high tide. It is a spectacular bird sanctuary. October 27: Today is a recreational day. After a leisurely morning start, we head to a running show store which we favor, and which offers special in-store sales on Tuesdays. Of course, we can stop by only once a year. We then head back to the campground to try out our new shoes on our favorite running course, a stimulating five-mile loop through rolling hills where you’re more likely to see cattle than people. This first part is a county park road, gated to keep out vehicular traffic; the second part, a lightly used country road. Unfortunately, the loop is connected by a couple hundred yards of the Pacific Coast Highway (1) which is high speed and certainly a little risky to run. October 28: We’re heading forty miles north up the coast beyond the cities and towns where the spaces are open and the shore is pristine. 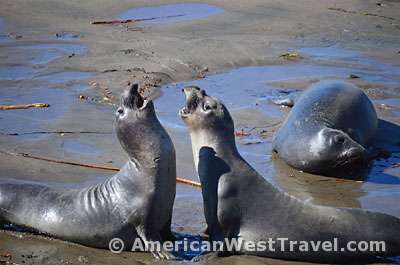 Our destination is the amazing elephant seal rookery at Point Piedras Blancas, about three miles north of the famous Hearst Castle which we visited last year. The elephant seal is the largest of all pinnipeds; a large bull can be 16 feet long and weigh 5,000 pounds. The first one came ashore in 1990, and there are now believed to be about 23,000 seals in the rookery though they are never on the beach at the same time. Summer is low ebb when there are only a handful of seals on the beach. The most exciting time is winter when the mature females come ashore to deliver their pups and then breed with the dominant males for the next season. Then there are many thousands of seals on the beach, and their activity is quite frenzied. In fall, the juveniles come ashore in great numbers; the docent estimated about a thousand on the beach. The section of coast features a craggy shoreline below low-lying bluffs. The seals’ center of activity is a small beach. They also fill in the pocket beaches and inlets north and south of the main beach. There is a boardwalk trail on the bluff above the beach allowing visitors easy observation; also, a trail heading north towards the lighthouse, with many good observation points. 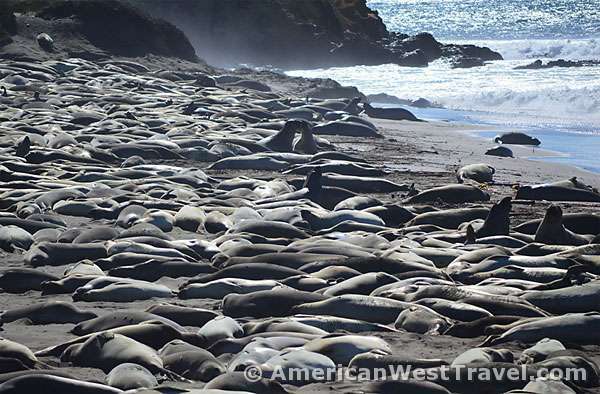 Most of the seals are simply resting on the beach. Many of the older males are mock fighting, practicing for when it is their turn to fight for harems. Others frolic in the water. It is an amazing opportunity to see such an aggregation of wildlife on a heavily traveled coastline. It is something you would expect to find in Alaska or on some remote island. We continue north another 12 miles to Ragged Point which is the southern starting point for the famous Big Sur Coast, nearly a hundred miles of sheer cliffs with the highway right at the top. 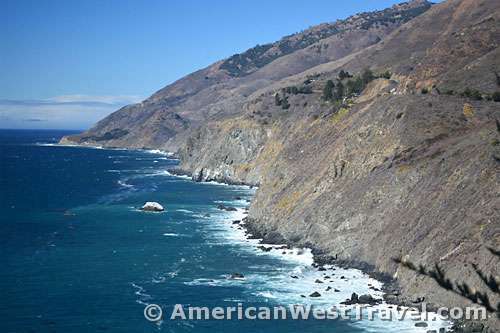 Ragged Point is a small peninsula (featuring a small resort) with outstanding vista points in all directions. From there, we head back to town, stopping at our favorite Morro Bay restaurant on the way. October 29: This was my most enjoyable day of the trip; the day of our beach walk. 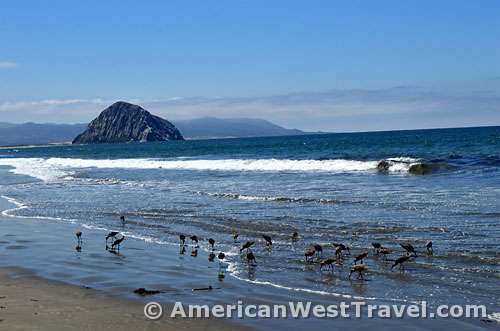 We always love to walk beautiful Morro Strand Beach with views of 700-foot tall Morro Rock (a volcanic plug) in one direction and the town of Cayucos and the bluffs to the north in the other direction. In summer this is a very busy beach. Today, expect for the occasional passers-by, we have the place to ourselves. It is a beautiful day: a slight cold front has left a crystal-clear day, mild temperatures, and a brisk onshore breeze. There is also impressive surf, with some waves in the eight foot range. The beach itself has a different look. With much higher tides, the sandy summer beach is largely flooded. It’s now a walking beach. We pick our way across the rocky headland separating Morro Bay from Cayucos, staying close to the cliff due to the high tide. From there, we head to the Morro Bay Farmers Market and another round of fresh, delicious treats we can’t get at home. We made a fall discovery: persimmons, of all things. Turns out, farmers market persimmons are a tasty treat. Luckily, the farmers are quite generous in letting customers taste their wares.